Colin and Beverley Dean’s company Special iApps was born of frustration. The couple were searching for suitable apps for their 12-year-old son William, who has Down's Syndrome and autism, but struggled to find anything tailored to his needs. While educational apps have to grab children to work, the heady mix of sound and visual stimulation can be distracting for those with learning disabilities. Apps overlaid with pop-ups and music can lead to sensory overload so Beverley asked software developer husband Colin to create some suitable for children like William. William’s weaker fine motor skills would see him struggle during activities like using cards to play matching games. By using touch-screen technology the couple hoped to remove one of the barriers William, and children with similar challenges, experienced. Head of design and photography Barbara Lowe, 51, works alongside the husband-and-wife team who set up the business in 2011. 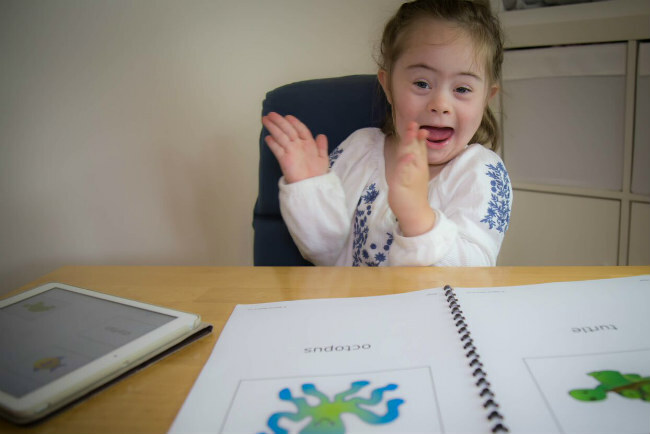 Barbara’s six-year-old daughter Maya, also has Down's Syndrome, and the three road test all the apps on their own children. The company has developed 12 apps, eight of which also operate on Android technology. Their flagship app is Special Words, a picture matching game designed to expand vocabulary, encourage clear speaking and improve fine motor skills. Their other key apps like Match and Find, Special Stories and Special Numbers focus on memory, social stories and numeracy respectively. Since Special iApps first started trading in September 2011 they have had 182,995 downloads and 746,626 updates of their mix of paid-for and free apps in over 100 countries. Special Words has been translated into 26 languages, including Albanian, Croatian, Ukrainian, Russian, Spanish, French, Spanish, Catalan, Dutch and Welsh. And though it has not yet broken into East Asian languages, Beverley says she has seen a video of a Japanese boy using the app — the software allows users to substitute their own sounds, words and pictures. But Beverley admits the firm has room for improvement on its marketing as they have come across people in the special needs sector unaware of its work. The firm, which last year converted to a non-profit community interest company, has a turnover of around £30,000 a year. Beverley admits they are “not making shedloads of money”, but the firm’s social and humanitarian successes have also brought rewards for the trio. All designed to be used alongside parents and carers, she said their apps are helping to support vulnerable children, some of them with terminal illnesses, all over the world. The two women balance their work with roles as full-time carers while Colin, 59, gave up a job in Durham University’s IT department to concentrate full time on the venture. Colin and Beverley’s older child Joseph, 18, a medical student, was the British voice for the firm’s apps before his voice broke. Ideas for new apps come from day-to-day interaction with their children and during the development stage the software is sent to volunteer schools and nurseries to trial. The firm is creating new apps on numeracy and literacy and has attracted funding to support their development, while existing ones are constantly updated. Professor Melissa Allen, who specialises in the psychology of education, has published research on the value of apps for children with autism. Professor Allen, whose research was published in Frontiers in Psychology in August 2016, says some apps can have educational benefits, but others are just a distraction. Parents should be careful even with apps marketed as educational as these also vary and there is very little research to support the claims, says Professor Allen. However, her research found that because of their interactive qualities children were highly motivated to use apps compared to trying to convey similar concepts through books. Professor Allen, of Bristol University, said: “If the kid’s already interested in interacting with these things then that’s a good way to help them learn some material. The academic said screen time should be restricted to ensure there is no negative impact on a child’s social development, attention and, when apps are used at night, sleep. Also, where possible, app usage should be supported by parents to help with concepts children may not understand and point out links between content on the software and real world examples. The National Autistic Society (NAS) promotes the use of an app known as Brain in hand, which is designed to help adults with autism remember activities, reduce anxiety and feel supported. It comes with remote support from the NAS, who will contact users when they press red on the app’s traffic lights anxiety monitoring system. Carol Povey, director of the NAS’ Centre for Autism, said technology can help those with autism develop new skills, become more motivated and improve concentration and contact with peers, teachers and parents. Images c/o Darren Devine: Maya Lowe, six, gets to grips with Special Words; William enjoying a session on the Special Words app designed to expand vocabulary, encourage clear speaking and improve fine motor skills.